WASHINGTON (April 07, 2015) -- Army training will likely always involve Soldiers going to the field and firing their weapons. But in the near future, it will also involve a lot more training in "synthetic" environments to make time in the field more productive and meaningful. "The next capability will be a leader-focused, Soldier-centric capability that immerses a Soldier, wherever they are at the point of training, in a synthetic environment, that allows us to tailor that environment to the demands of the leader," said Col. David S. Cannon of the Combined Arms Center, or CAC, on Fort Leavenworth, Kansas. Command Sgt. Maj. James Sims, with Army Materiel Command, tries out a scenario in Virtual Battle Space using a set of 3D goggles, during the 2015 Association of the United States Army Institute of Land Warfare symposium in Huntsville, Alabama, March 31, 2015. Experts at the CAC and U.S. Army Training and Doctrine Command, Cannon said, believe the next evolution in Army training will be introduced between 2023 and 2031, and will involve synthetic training environments connected together by a global network that allows Soldiers all over the world to train together, wherever they are, using training regimens that were designed by experts for not just specific mission types, but for missions in specific parts of the world. "A Soldier in Korea can be trained with a Soldier at Fort Hood," Cannon said. "A Soldier preparing to deploy in support of a global operation can train his task in that immersive environment and the culture, at home station. And not just one time, like at one of our combat training centers, but numerous times." Cannon attended the Association of the United States Army, or AUSA, Institute of Land Warfare Global Force Symposium, March 31-April 2, in Huntsville, Alabama. There, he manned a display that highlighted the evolution of "training the basics" from World War II, to Bosnia to Iraq and Afghanistan. In World War II, Cannon said, it was clear who the enemy was - they wore a uniform - and there was little interaction on the part of Soldiers with the civilian population. In Afghanistan and Iraq, he said, it became more unclear who the enemy was, and there was much more interaction with the civilian population, demonstrating an increase in both "ambiguity" and "chaos" in the operating environment. Cannon said future operating environments will be different than they are today, but ambiguity and chaos on the battlefield will continue to increase. Solders must be trained for such environments, even when it is unclear what exactly those environments will look like. "The trick is to fight the unknown, to determine the unknown before we know it," Cannon said. He said the expectation is to develop training tools that are adaptable to whatever capability a commander needs to train on, and to make it possible for a commander to train his Soldiers wherever they are. "It'll be cloud-based, network-delivered, device-oriented capability that is borne on the mission command information network," he said. "It'll be wherever the Soldier is located." Training courses will be developed centrally, by academics and military experts, and will be constantly updated and upgraded to match the needs of the commanders that request them and to meet the demands of any environment or situation that needs to be trained, Cannon said. Soldiers will interface with that information and those scenarios through gear that is not-yet developed, but which help simulate various types of military equipment that a Soldier would need to train for an operation, skill or technique. "Our Soldiers can relate to this: it's not necessarily a rifle, but a device that replicates a rifle," Cannon said. "Not a tank, but a device that replicates being inside a tank. Do you need a tank to train a tank? Our answer is no. "Our answer is you have to have the haptic and tactile and immersive environment wherever you need. You will have an immersive environment, some kind of device, and maybe a projector that maps the room that provides you with what the inside of the tank looks like. And more important, what the environment looks like." Units, Cannon said, will have the necessary gear as part of their training equipment, and the information that provides the scenarios and training courses will be available anywhere via the global network. "So we are building a synthetic training environment which allows us to improve the immersion of our Soldiers - training our units, our larger formations, and our senior echelon leaders in the environment they will encounter in a complex environment." The Army already uses simulated training, Cannon said. One example was on display at AUSA. Cannon had a copy of the 3D video trainer "Virtual Battle Space," or VBS, on a computer there running a scenario that would be familiar to those who conducted operations in Iraq. 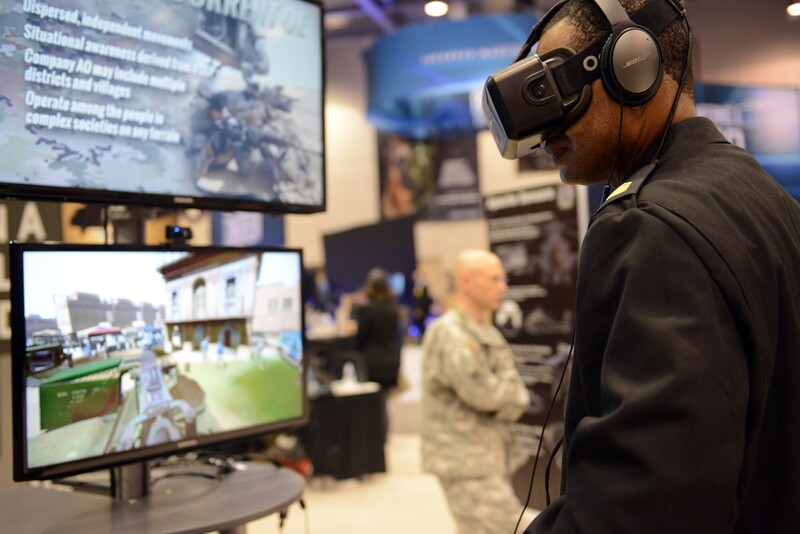 But Cannon had a set of 3D goggles attached to the game that allowed conference attendees to immerse themselves in the scenario in 360 degrees - something that is not done in the Army. Putting on the 3D goggles and a pair of noise-cancelling headphones, a "player" stood in as gunner on a Stryker combat vehicle and went along on the mission. Unlike playing the game on a laptop or desktop computer - which is how Soldiers use the game now - with the 3D headset, the player was immersed in the game. A sensor in front of the player rotated field of vision in the headset as he rotated his head - as though he were actually in the game. Cannon said the 3D goggles are not yet part of the Army's VBS program, but he said the experience offers a glimpse of what the Army is hoping for with its synthetic training environment. The VBS simulator is not the only training capability the Army uses now, Cannon said. "In the games for training portfolio, we have 92 training support packages that allow a squad leader to actually train his Soldiers on a variety of tasks from home station and in a classroom," he said. "They don't have to go out to the range or field - they can do it in the dayroom using a military gaming computer." Cannon said there are applications to assemble, disassemble, or clear a weapons system, for instance. And doing it on a simulator is an inexpensive way to get in practice before doing it for real. "They will get the repetitions they need," he said. "And we make it fun for them. We make it so they compete against their buddies. So by the time they get to the range, they enter at a higher skill level than we would have if we had put them on a bus and took them to the range and started firing." There is great cost in taking Soldiers to the range or to the field to practice tasks for the first time that could have been honed in garrison, Cannon said. "We do see cost savings here. By being in an immersive, synthetic environment, I'll get more repetitions. So when I go to the live environment, I'm better. I'm more trained. I'm more capable of doing what the mission calls for. A completely synthetic environment reduces the amount of overhead. The contractors and the people you need to run these large, complex 20th-century technologies - we won't need them anymore." The complexity of the current operating environment, and the expectation of an even more complex future operating environment, means Soldiers need repetition in training, and a lot of it. Time spent training in the field is better spent learning to adapt to changing situations and scenarios than to learning basics which could be taught back home. "The last 12 years of conflict really showed us what we really need are those rich repetitions," Cannon said. "And how you achieve that richness in repetitions - you can't wait to a live environment anymore. We have to provide a synthetic environment that immerses that Soldier and that leader into the complexities that he or she will face. "We are continuing to build the architecture, leverage the technology, leverage industry, and get the requirement right, to get the capability we want right," Cannon said. "What we are trying to do is develop a future capability that outpaces technology, our adversaries and the environment."